The WPP is just over 2 years old and growing rapidly. 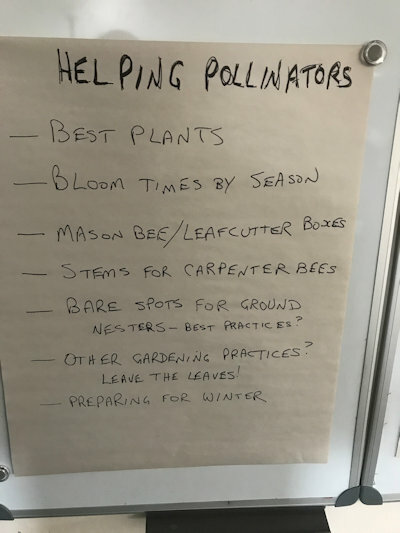 This winter we asked members to fill in a short survey so that we could get a better idea of who they are, what they are doing, and what they need. 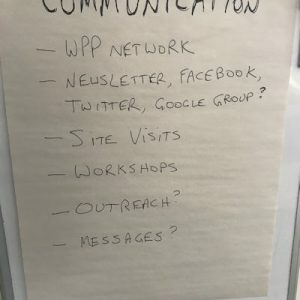 It was immediately apparent from the answers, that the real need was to talk to each other, so WPP started organizing a colloquium (col = together, loqui = talk) to do just that. 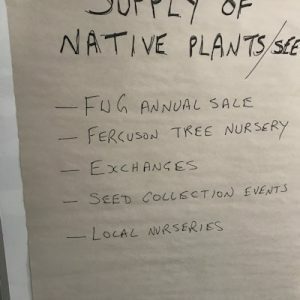 We invited everyone on our mailing list, and luckily only 31 people attended – luckily, because we have only about 35 chairs at the FWG, where we decided to hold the event on 3 March 2019. As people started to arrive, it was obvious that this was a good thing. 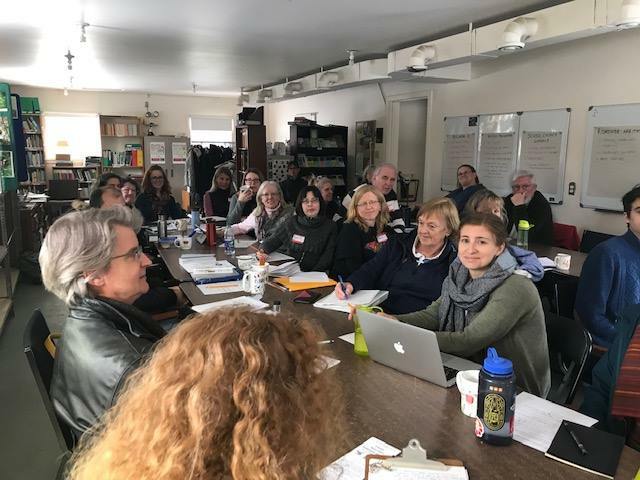 Representatives of organizations greeted each other, some renewing old friendships; individual gardeners joined in or found each other and started to compare notes. 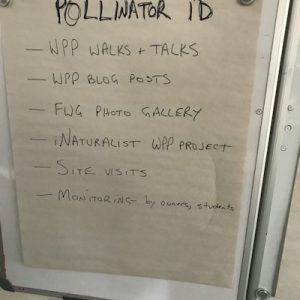 After a brief introduction to Wild Pollinator Partners, we invited people to introduce themselves and say a bit about their connection with pollinators. 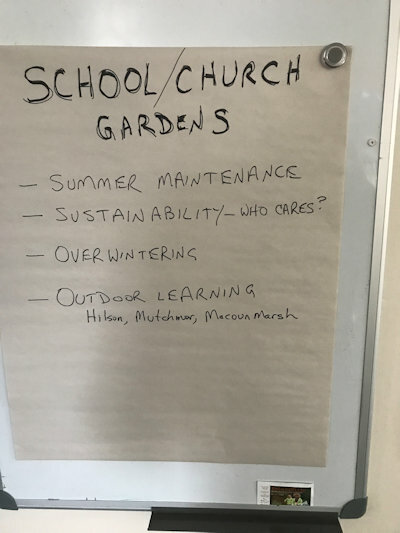 This turned out to be the most popular and useful part of the afternoon, as the diversity of projects, the interest and enthusiasm, and the extent of the work that many of us are doing was a surprise and a delight. 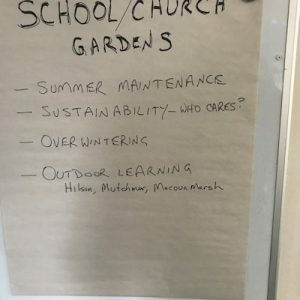 Examples: the local Monarch Teacher Network has established Monarch waystations at more than a dozen locations in Ottawa, mainly school grounds, and continues to lobby the school boards for more “greening.” The National Capital Commission has reclaimed a golf course in the Greenbelt and will be working to turn it into an education centre. 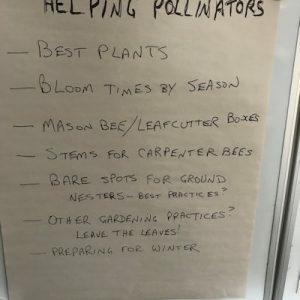 Jeff Skevington, a research scientist with Agriculture and Agri-Food Canada, has just written a field guide to the flower flies, pollinators that few of us know about. All 31 people at the tables had something important to contribute. We’ve produced a list of participants that can be found on our web site. By now everyone was tired of sitting, so we broke for coffee and cookies. Conversations sprang up everywhere and the level of chatter rose as people gravitated toward others with similar interests to talk further about what they heard during the introductions and mini-talks. 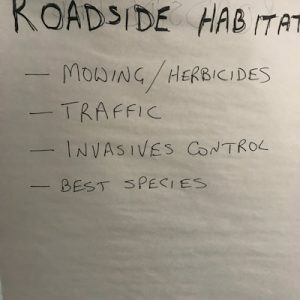 Unfortunately, we were running out of time and had to omit the small group discussions that we had hoped to focus on roadside habitat, school and church gardens, supply of native plants/seeds, and communications. Instead, we held an informal plenary session in which people could ask questions and provide further information. Note: If you have anything to add to the participants list, volunteer sources, or donors, please share. We can update this information any time and keep it on our web site for easy access. 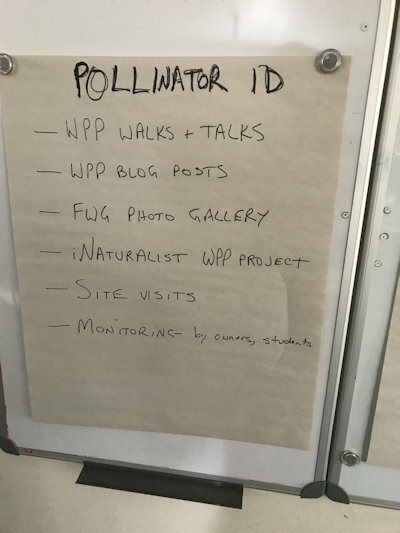 If you did not make it to the colloquium, we would still be happy to add your name, projects, web sites, blogs, and other pollinator-related information to our list. Although we are delighted with the success of this first effort to bring people together, we realize we didn’t plan enough time to do everything we wanted to do. We were hoping, especially, to gather information from the network in a more directed way. 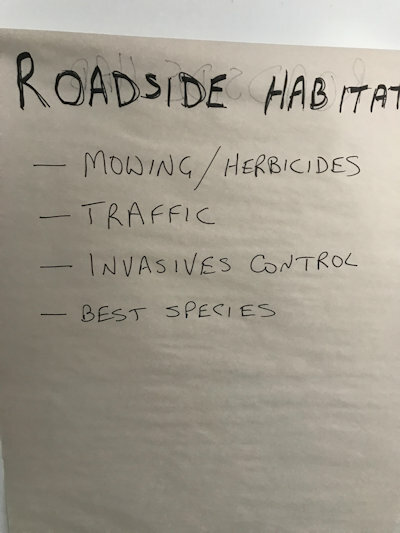 For example, we prepared posters listing issues and ideas around some themes that have come up over the last few months. 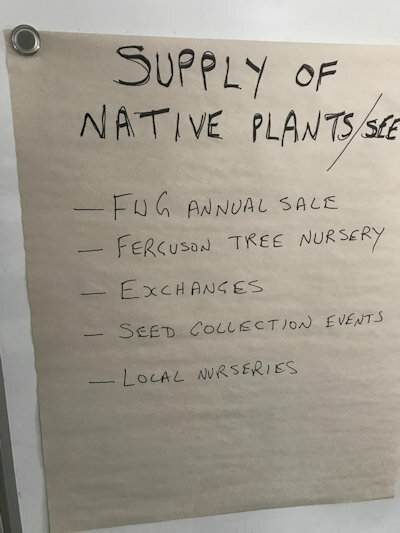 We planned to give people sticky notes, so that they could record their own thoughts and questions, expressions of interest, ideas and stick them to the appropriate poster. Jim Davidson kindly photographed the posters, so here they are. Please send us your “sticky notes” as email, so we can expand on some of these issues. The real need is for good communication. We want to find ways to keep in touch with each other as we all have so much to learn – and to teach. I think the most important result of our colloquium was finding that people DO want to talk to each other and that talking is useful. 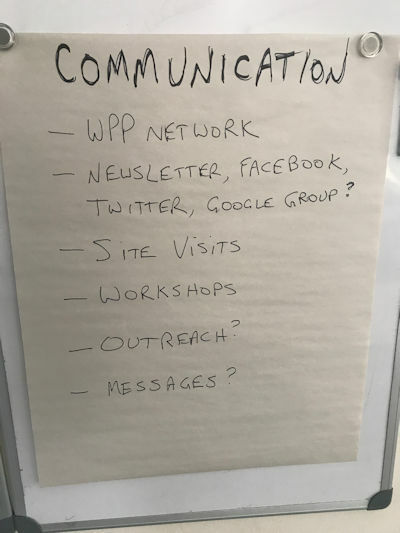 WPP plans to create more opportunities to do that and to inform the network about some of the things you want to know more about. Please see our web site for upcoming events and watch for more announcements as we organize site visits and garden tours over the summer. We will definitely hold another colloquium next winter/spring. We may even have a season wrap-up event in the fall.